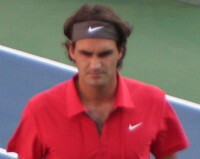 Federer had the match won, in his head, after going up an early break in the second, having won the first set. Raonic however, was not quite ready to concede the victory. Federer knows the strengths and weaknesses of his opponent. His strategy, make Raonic move, something Raonic is still struggling with. In the first set, he executed his plan perfectly; yet Raonic found a way to turn the tide in the second set. He served much better in the second set, hitting his groundstrokes with authority instead of rushed and panicked. He also cut down on his errors, forcing Federer to hit one more ball. It was now a match. Both players were thoroughly engaged and neither was willing to lose. Unfortunately, someone had to. The third set was a mental battle, and the stronger will would prevail. Raonic felt the pressure mounting serving from behind. They both struggled to hold their serve initially in the third; yet just when it appeared that it would go to another tie-break, Raonic inexplicably cracked. He would double-fault to give Federer a break opportunity and a weak second serve would seal his fate. The more confident player won, Federer, 6-4, 6-7(2), 6-4.